In many of the early digital transformations, innovators used web technology to improve upon the way things had been done in a given industry. Amazon made it easier to find and purchase a book or CD. Netflix made it easier to rent DVDs through the mail with an innovative subscription model. Salesforce made it simpler to adopt CRM software via its pioneering SAAS (Software As A Service) model. As the digital revolution has evolved, and the technologies have advanced, a second phase of innovation has seen successful companies fundamentally redefine entire industries, with new value propositions, new business models and new cultures. Amazon has become a retail platform that leverages crowdsourced customer reviews, uses analytics to predict what each customer wants, and enables third party sellers alongside its own offerings. Netflix migrated to streaming, becoming the dominant player, and is now using its massive customer data set to design original programming that will appeal to specific segments of viewers. Salesforce has become a business solutions platform, branching out from CRM to include service management, and introducing its Lightning platform that allows customers and third-party developers to more easily customize or create applications. As discussed below, the winners of the BPSS digital transformation will develop these kinds of phase-two solutions that redefine the industry. • Customers are dissatisfied with legacy vendor solutions that don’t deliver and demonstrate compelling value. For example, in many situations, services are being sold as the “what?” (scheduled on-site, truck roll-based PM services) and the “how?” (delivery of ‘hours’ as a commodity and check-the-box task completion) rather than the “why?” (increased uptime reliability, sustained levels of occupant experience). But progressive buyers of services are increasingly less willing to pay for BAS or chiller service agreements that are based on labor rates and hours. They are much more willing to pay for performance, tying service fees to verified outcomes, such as critical equipment uptime. • Customers’ expectations have been raised by the innovative, responsive and customer friendly companies they deal with in other parts of their business and personal lives (Salesforce, Amazon, Uber, etc.). • SCADA systems are commoditizing BAS offerings and eroding the “lock-in” power of their proprietary products. • ASHRAE is helping drive the adoption of open protocols and metadata definitions with its proposed standard 223B, announced in February of 2018. In response to commoditization and changing customer expectations, the new technologies are first being used to make existing service models more efficient. Instead of sending a BAS or HVAC technician to do a preventive inspection, or to troubleshoot a problem, forward thinking solution providers are using remote monitoring and analytics to perform those tasks more effectively and at lower cost. New technologies also allow them to demonstrate the value they are creating by documenting critical outcomes, including equipment uptime, space conditions (including IEQ) and energy consumption. This approach is still somewhat innovative, but it will rapidly become table stakes, the standard for doing business at the bottom of the BPSS value stack. Further up the value stack are solutions that leverage data and analytics to provide guaranteed service level agreements (SLAs), in which the customer pays a variable fee based on verified outcomes achieved and sustained. Another set of higher value offers will be based on lifecycle management and long-term asset planning. For example, a solution provider may guarantee the ten-year lifecycle costs of a chiller, and take responsibility for installation, continuous commissioning, maintenance, any required rebuilds, cooling and energy performance, and financing. Or the service company may own the chiller and related equipment, providing chilled water as a service. 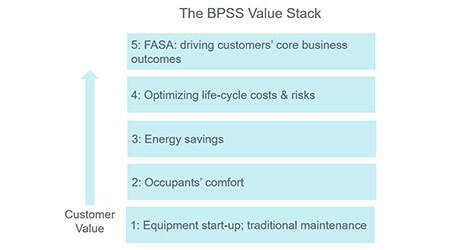 At the top of the value stack are solutions based on an approach that we call FASA, or Facilities as Strategic Assets. The vendors and customers who adopt this approach view facilities as strategic assets that must be managed to drive the success of the customer’s core business. Their goal is to manage the design, maintenance, operation and retrofitting of buildings to measurably improve business (not just building) outcomes. Similar to the pattern in other industries, the solutions higher up in the BPSS value stack will be enabled by a flexible value-creation ecology based on digital platforms that collect, analyze and learn from building and business data. • Technology: A leading manufacturer of networking equipment negotiated a performance-based agreement, in which its HVAC service company is paid an annual fee to assure uninterrupted cooling availability for servers that perform mission-critical simulations. The agreement includes large financial penalties that the service company is charged in the event of an interruption. It is up to the service company to decide what strategies to employ to avoid such outages, i.e., the mix of maintenance, redundant equipment, remote monitoring, etc. There are no contractually scheduled truck rolls, task checklists or specified hours beyond an annual total system performance assessment. This outcomes-based, FASA agreement has benefitted both parties, expanding the value pie. The service company received a multi-year agreement at attractive margins, reflecting the responsibility they were taking on, and the business value they were delivering. The manufacturer enjoys largely uninterrupted operation of a critical business process and gained a true partner who understands its core business priorities, and actively “looks around corners” on its behalf. • K-12: A Wisconsin school district has put the educational mission at the center of its facilities management process and capital plan, with students’ academic achievement and personal growth as the number one objective. Every member of the facilities staff is bonused based on student test scores! • Commercial Office: WeWork began as a shared office space provider. It used innovative design to decrease the amount of square footage per employee, while making the spaces more inviting and productive. It now collects and mines data from its large number of customers and buildings to improve its design and operational standards to further drive employee productivity, wellness, retention, etc. WeWork is now providing services to large enterprise customers, helping them utilize space more efficiently, while also improving business outcomes. Privately held, WeWork has reportedly raised more than $4 billion in funding, and was valued at $20 billion in a July 2017 funding round. As has been the case in other industries, the BPSS profit pool will migrate away from the companies offering legacy products and services and to those offering higher value solutions. We believe FASA solutions will capture a large share of industry profits in the years ahead. By their nature, FASA solutions are on the radar screen of C-Level decision makers. Companies offering these solutions will sell at the C-level and have the opportunity to become trusted business partners. That can lead to long-term relationships in which a FASA vendor deploys its solutions across a customer’s entire facilities portfolio This can streamline the procurement process, shorten the sales cycle and reduce the cost of sale—to the benefit of both parties. Compared to the culture of Silicon Valley, many organizations and professionals in BPSS have a scarcity mentality, tending to view their business interactions as a zero-sum game. We believe that this is in part due to the legacy culture of the construction business and the Design>Bid>Build process. Whether in new construction or retrofit projects, the procurement process often focuses on first cost instead of lifecycle value. This creates perverse incentives for vendors to “compete by cutting corners.” FASA strategies require an abundance or win/win mentality. The goal for vendors is to innovate to create new pools of value that can be shared between the vendor, the customer and other partners in the value ecology. In the era of big data and analytics, customers will have more and more information about the value of facilities-related products and services. Vendor strategies based on customers having incomplete information or based on lock-in to proprietary products will be less and less viable. In this environment, sustainable profitability is best seen as the outcome of creating verifiable business value for customers. In strategy development and in day to day execution, the most successful companies won’t solve to profitability. They will solve to creating customer value in some unique, differentiated way, with a business model that allows them to capture a fair share of the value pie as profit. Ultimately, that focus on creating unique business value for customers is the essence of the approach we are advocating, a compass that can guide solution providers and building owners as they navigate the digital transformation of the BPSS industry by developing FASA strategies. Dan Diehl is the CEO of Aircuity. Paul O’Malley is the owner of Paul O’Malley Associates, LLC, a strategy and execution consulting firm.